The past decade has seen a stagnation in U.S. biomedical research funding. 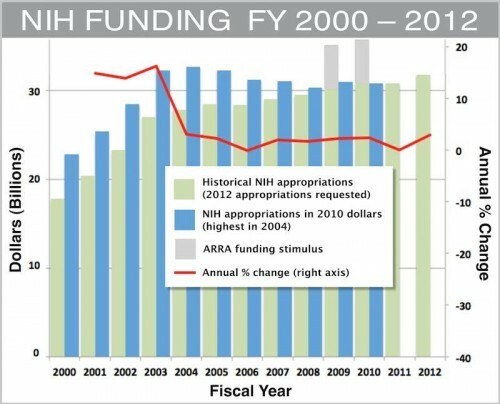 Since 2003, there has been a trend of flat or below-inflation funding for the NIH (see graph, NIH appropriations in 2010 dollars ). In February 2009 under the American Recovery and Reinvestment Act (ARRA), the NIH received $10.4 billion in new funding, which temporarily revitalized the biomedical research community. 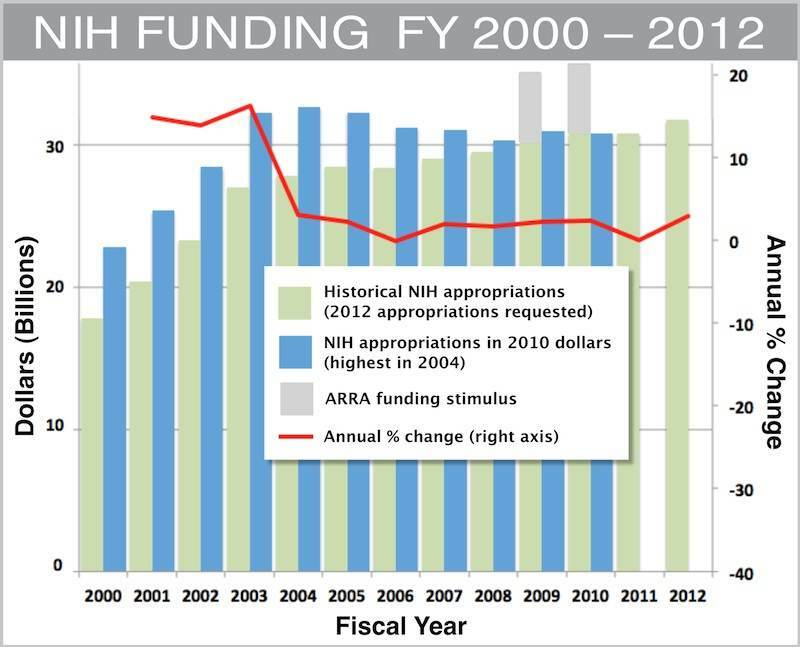 Unfortunately, a continuing resolution has held NIH funding in 2011 at the $31 billion it had in 2010. The $3.7 trillion budget proposal President Obama submitted to congress allocates just 4% to research and development in the 2012 fiscal year, a small decrease from 2011 after accounting for a projected 1.3% rate of inflation . The NIH would receive an increase of just 2.4% ($745 million) over its 2010 budget . Taking into account a 1.3% rate of inflation reduces the NIH budget increase to just over $341 million, a meager 1.1% over its 2010 budget. Here’s a closer look at research priorities outlined by the NIH for 2012. According to report by the NIH on the President’s proposed 2012 NIH budget, the NIH will use the requested $32.0 billion to support “innovative research across the spectrum from basic to clinical, with a focus on one major area of extraordinary opportunity, and three other themes that are exceptionally ripe for investment and critical to improving the health of the American people” . In January, NIH Director Francis Collins announced plans to move ahead with the creation a new translational medicine center called the National Center for the Advancement of Translational Sciences (NCATS). NCATS will catalyze innovation at crucial junctures in the pipeline for diagnostics and therapeutics discovery and development, spur new public-private partnerships and facilitate the regulatory review process through recent initiatives including the NIH-FDA Leadership Council and a research program in Regulatory Science. NCATS will align and bring together a number of trans-NIH programs, such as the Cures Acceleration Network (CAN), which plays a leading role in the effort to accelerate the development of “high need cures” through the reduction of barriers between research discovery and clinical trials; the Clinical and Translational Science Awards (CTSA) program; and the Therapeutics for Rare and Neglected Diseases (TRND) program. To help investigators illuminate the complex causes of disease, in FY 2012 the NIH plans to support further developments and application of advanced technologies such as DNA sequencing, microarray technology, nanotechnology, new imaging modalities and computational biology. In FY 2012, the NIH will support rigorous programs for assessing and ensuring the effectiveness of newly developed treatments within populations and for individuals. Personalized medicine research will enhance the evidence base for decision-making in clinical practice. The future of biomedical research in the U.S. depends upon young scientists. In FY 2012, the NIH will emphasize two programs: the NIH Director’s New Innovator Award, which supports exceptionally creative new investigators with potentially high-impact projects; and the Early Independence Program, which enables the most talented young scientists to move directly from a doctoral degree to an independent research career. As part of the President’s initiative to emphasize support for science, technology, engineering, and mathematics (STEM) education programs, the budget proposes a 4% stipend increase for predoctoral and postdoctoral research trainees supported by the NIH’s Ruth L. Kirschstein National Research Service Awards program. The $794 million training investment will allow the NIH to continue to attract high-quality research trainees to address the Nation’s future biomedical, behavioral and clinical research needs. Cancer: Continuing to pursue discoveries in basic cancer science and the development of new cancer treatments and methods for prevention and early detection of cancer. Alzheimer’s disease: the NIH is partnering with the private sector to find new methods for early diagnosis and to support early drug discovery and preclinical drug development. Autism spectrum disorders: the NIH will continue to research environmental factors, early detection and novel treatments. HIV/AIDS: the NIH will devote nearly $3.2 billion for research on effective vaccines and other preventive measures for HIV/AIDS. Act Now to Protect Research! Irrespective of all the research priorities outlined above, science funding in 2012 is under attack. The U.S. House of Representatives is debating unprecedented multibillion dollar cuts to the budgets of the NIH, National Science Foundation (NSF), Centers for Disease Control and Prevention (CDC), Food and Drug Administration (FDA) and Agency for Healthcare Research and Quality (AHRQ). The promise by Congressional Republican’s to rein in federal spending for the 2012 fiscal year completely ignores the importance of investment in biomedical research and the jobs it creates, not to mention the fiscal and lifesaving benefits. The House of Representatives passed H.R. 1 on February 19th . The bill now moves on to the Senate and could be voted on this week. H.R. 1 will cut NIH funding by $1.6 billion (5.2%) below the current 2010 level and reduce the budget for medical research to $29.4 billion — back to 2008 levels, not accounting for inflation. The proposed reductions by the House of Representatives are a serious threat to our nation’s health and economic competitiveness. Contact your members of Congress today and tell them funding for health research is vital to curing diseases, generating jobs now and in the future, and securing the economic well-being of America. Obama’s 2012 Budget Proposes Pains, Gains for Science. Wired Science. 2011 Feb 15. 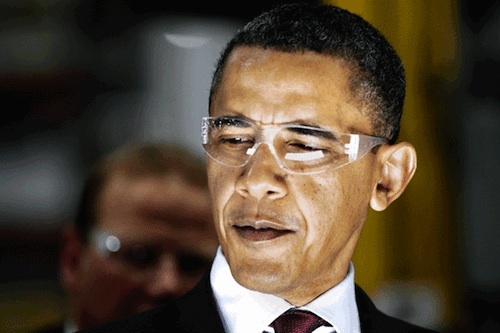 Obama resists research cuts. Nature News. 2011 Feb 15. President’s Proposed 2012 NIH Budget. NIH. 2011 Feb 14. H.R. 1: Full-Year Continuing Appropriations Act, 2011. GovTrack.us. Accessed 2011 Feb 26.